Let’s go ahead and address the sno-cone issue. It produced quite a response from all you gals! Let me say that it IS ridiculous that they don’t sell sno-cones here. It has baffled me for the nearly 4 summers that I’ve lived in this blazing hot city. In Florida, of all places, why wouldn’t someone tap into the lucrative business of perfectly cold, finely shaved sugary, syrupy ice. For no more than $2 per cup. Why? Why? Why? It has bothered me so much that I’ve tried to work out in my head how I could open and run one – with a small child or two in tow. The overhead can’t be that much. Buy a stand alone building. Buy the ice machine. Keep the ice, syrup, cups, and spoons in stock. Only open from 11 am until 4ish. I mean, it seems pretty perfect to me. Alas, I haven’t been able to figure out how I could make that happen and so I will suffer through another summer sno-cone-less. THIS is what a mean when I say I want a sno-cone. This is NOT what I mean. See the difference? Phew…that took longer than I expected! Moving on. 1. Maxi dresses. I feel confident these are going to become more and more valuable to me as the summer months tick on and my belly continues to expand. I bought one at Old Navy a month ago and wish that I’d gotten one in ever color because I could straight up wear it every day. Alas, they’re not selling that particular one anymore. I’ll have to hit the local Old Navy’s and see if I can find any on Clearance. 2. The Regular at Gabriel’s in College Park. I had one of these babies for the first time last month and my taste buds scream for it at least once a week as a result! I’ve only indulged once but, good gravy, that’s the best sandwich I’ve ever had. I don’t even remember what all is on it but the combination of the banana peppers and the sweet pickles is genius! 3. My long hair. Because I can put it atop my head as well as get away with only washing it every OTHER day. Just keeping it real. 4. Haagen-Dazs Pineapple Coconut ice cream. Holy. Moly. Throw some strawberries int here and I’ll consume a pint right in front of you. I’ll do it. I’m not ashamed. 5. My doctor. He doesn’t condescend or patronize when I ask 500 questions, most of which are a little on the ridiculous side. He’s not drippy or mushy gushy but he will do whatever he needs to do to put my mind at ease. And I’m never in his office for longer than 20 minutes. True life! Dr. Gibbs is the best! And that’s all I’ve got for now. I’m sure my favorite things list will continue to grow and as it does, I’ll fill you in. Also coming soon will be a list of things I’ll be adding/removing to the new born phase of our lives this time around. I didn't get a chance to comment about the sno-cones on the last post, but no one should have to live in a town without sno-cones. Even teeny, small towns have a sno-cone stand. Remember how we used to dig in Laury's car for change for our Friday afternoon sno-cone?? Hang in there!! 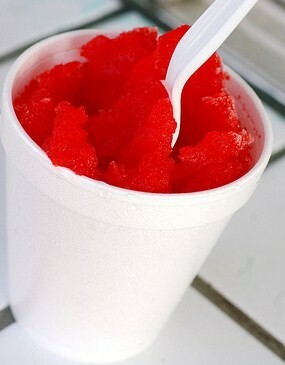 We have a great sno cone stand right down the road from us that is already opened and ready for you! only a few more dayssss! Like I said…I will hook you up! Sooooo sorry I didn't see your post sooner! Love this place. It fills a deep-seated need of mine about twice a year. May it bring You much happiness as well!